Mumbai-based Minex Metallurgical believes in constant innovation to develop top-notch alloying solutions. Innovation comes not from doing something once but from doing it over and over again, believes Sukhendu Bikas Misra, Founder and Managing Director of Minex Metallurgical Co Ltd. The company, founded in 1981, provides metallurgical alloying solutions to clients across the world and prides itself on developing cutting edge technology. A focus on innovation was initially a necessity to differentiate itself in a competitive market but has now become a part of its DNA, asserts Misra. "The driving factor for Minex was producing alloys which are not produced in the country," says Misra. "We don't make too many quantum jumps, but focus on developing the products we have." One of Minex's important projects is with the Indira Gandhi Centre for Atomic Research (IGCAR). Minex has been developing a shielding material for nuclear reactors along with IGCAR over the past five years. Misra aimed to start a foundry from the days he was studying at Regional Engineering College, Rourkela, where he specialised in metallurgical engineering. He initially worked for companies such as Advani Oerlikon Ltd and SICOM Ltd. These stints paved the way for him to launch his own company. At Advani Oerlikon, now Ador Welding Ltd, he learnt the process of manufacturing ferro alloys, while at SICOM, a leading financial institution, he learnt the basics of project financing. SICOM later provided him with a part of the seed capital of Rs 33 lakh he needed to set up Minex. The company established its first plant in Nagpur, largely because SICOM provided incentives to companies coming up in and around that town. Today, Minex operates in three industries - foundry, steel and aluminium. Misra has steadily scaled up operations and believes in keeping commitments to his clients at any cost. 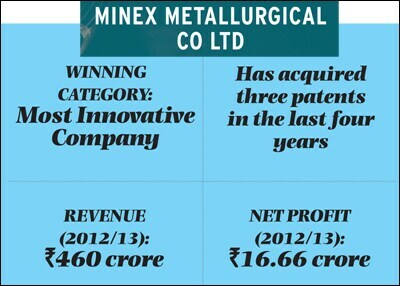 Minex's profit after tax has grown more than 60 per cent to Rs 16.66 crore over the past five years, while sales have doubled to Rs 460 crore in the same period. Misra expects annual revenue growth of 18 to 20 per cent and profit growth of 15 to 18 per cent over the next five years. Minex spends about five per cent of its profit on research and development. Along the way, Misra has understood the value of intellectual property after his products were copied by rivals. Minex has now acquired three patents in the last four years. "We started doing this just over the last four or five years in our history of 30 years. Had we gone in for patenting from the beginning, we would have had 100 patents by now," says Misra. The company now intends to apply for at least one or two patents every year from now on. He is also on the lookout for partnerships that will help him innovate and bring in new products faster.